DRAFT ANALYSIS: “A special talent who can play on the inside, burn his opponents on the outside or go forward and wreak havoc up there." The forgotten man of the 2018 draft crop is a special talent who has very few deficiencies in his game. Jye Caldwell is a player who can go inside, spread to the outside or play up forward and still have an impact. Athletically, Caldwell is very similar to recently retired Bulldog Clay Smith at the same age, and has that fierce attack on the ball and ability to hit the scoreboard similar to Smith. Caldwell unfortunately has not had luck on his side this year, with injuries restricting him to just three TAC Cup games and one National Under 18s Championships game, as well as missing games through playing for his school, Geelong Grammar. Recruiters are aware he is a super athlete so how much he tests at the upcoming National Draft Combine is unlikely to affect his draft prospects, with the pocket rocket likely to land somewhere inside the top 30. Caldwell has a lightning burst over 20m, recording one of the highest 20m sprints (2.983 seconds) of the TAC Cup, while also impressing with his agility score of 8.175 seconds. His ability to weave his way through traffic or burst out of a stoppage is imminent, and it is something the Pioneers, and Vic Country would have loved to have had available all year. To complete his top performance in the pre-season testing, Caldwell also tested in the top group for the Yo-yo test, recording 21.2. It is hard to read too much into his 2018 year, with injury wiping out most of it, but he had an impressive 24 disposals, seven tackles and a goal earlier in the season. Caldwell has the goal sense to play down forward and create something out of nothing. He can use his class to pick up a loose ball and cleverly snap around his body, or he can work his opponent under the ball and use his smarts to win the football and hurt opponents that way. His defensive attitude is as impressive as his offensive capabilities, laying fierce tackles and putting defensive pressure on the ball carrier. Finally, his ability to win the ball on the inside or outside is a huge positive for any AFL club looking at him, while his leadership traits saw him earn co-captain of Vic Country with Sam Walsh. Given Caldwell has had limited matches in his top-age year, and the clear improvement is just getting on the park and getting minutes into his legs. He has a really strong base from which to work with heading into an AFL club, and has just been unlucky with injuries. Given the amount of time he has lost, the AFL club that picks him will likely monitor him over the pre-season and make sure to the best of their ability that the hamstring injuries he has sustained do not reoccur. The second improvement worth noting is his kicking consistency. He can look unbelievable on some days, and less effective on others, sometimes missing targets through overhitting his kicks, but when on his game, his skills are impressive. Caldwell is a well-balanced prospect who has a good combination of skills, smarts and athleticism that make him an exciting player. 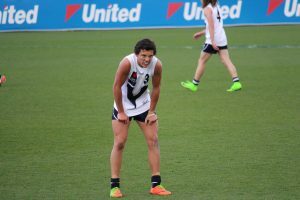 The fact he received a National AFL Draft Combine invitation despite playing very few games is testament to his ability and how highly clubs rate him. Chances are his injuries might have knocked him back a peg in the pecking order, but expect him to still be in the early stages of the draft, with a second round, or if a club pounces in the late first round, as his draft projection. He is one of those players that could end up top 10 on pure talent, and has very few deficiencies in his game, so there should be no shortage of clubs who would consider Caldwell in the early part of the draft.